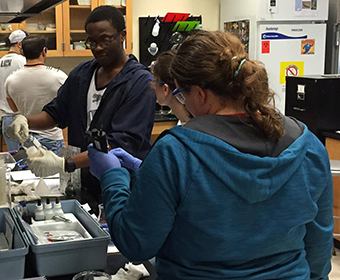 UTSA researchers awarded a grant to support graduate students in the science fields. (Oct. 18, 2018) -- Promoting and strengthening the ability of Hispanic Serving Institutions (HSIs) to develop programs that attract, retain and graduate outstanding students capable of enhancing the nation’s food, agriculture, natural resources and human (FANH) science workforce is the goal of a four-year, $275,000 United States Department of Agriculture (USDA) National Institute of Food and Agriculture award to The University of Texas at San Antonio (UTSA). This interdisciplinary project, led by Janis Bush, a UTSA professor of environmental science and ecology, is funded by USDA’s Hispanic Serving Institutions Program. Through Project ASSIST (Advancing and Strengthening Science Identity through Systematic Training), Bush and her team will design an innovative education model that can be transferred to other minority-serving institutions with student populations similar to those at UTSA. Building an effective model first means understanding the barriers to, and the support mechanisms for, enabling underrepresented minority student success. Targeting high school, undergraduate and graduate students, Project ASSIST develops and tests a unique model that cultivates students’ science identity – combining holistic mentoring, writing-to-learn and public science communication – to enhance the quality of undergraduate agriculture education at Hispanic-Serving Institutions (HSIs). It also aims to increase persistence and graduation rates of underrepresented minority (URM) students pursuing bachelor’s and advanced degrees in agricultural fields at HSIs. An interdisciplinary team of UTSA faculty from the College of Education and Human Development, College of Sciences, and College of Liberal and Fine Arts will work collaboratively to develop the comprehensive program, which will address the personal, cultural, social and institutional barriers faced by underrepresented minority students. The program will focus on two skills for future leadership: (1) writing-to-learn activities designed to improve content learning and bridge the gap among lower and upper division courses and encourage graduation; and (2) public science communication training, a value-added skill that responds to the demand for scientists as engaged leaders of public deliberation. These skills will be integrated across specific writing intensive classes for the Environmental Sciences at UTSA. “We want to create a pipeline from area high schools to UTSA to increase the numbers of students pursuing majors in food, agriculture, natural resources and human science. These students will develop rigorous skills in science that will make them attractive future employees of natural resource and conservation organizations,” said Bush. The UTSA team includes Janis Bush, principal investigator (PI) and professor and chair of Department of Environmental Science and Ecology, Amaury Nora, professor and associate dean for research in the Department of Educational Leadership and Policy Studies, Sue Hum, associate professor in the Department of English, Kenneth Walker, assistant professor in the Department of English, Jeffrey Hutchinson, assistant professor in the Department of Environmental Science and Ecology, Gwen Young, lecturer in the Department of Environmental Science and Ecology and Juliet Ray, director of Grant Services at Johns Hopkins University. Learn more about UTSA College of Sciences. Learn more about UTSA College of Liberal and Fine Arts.